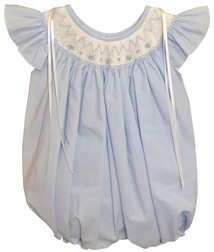 Another precious smocked bubble by Will'Beth for infant girls just perfect for Easter and any special occasion. 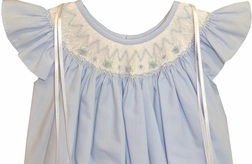 The bubble is made in blue and is bishop smocked with blue rosebuds bullions embroidered in the smocking along with blue geometric designs. The shoulders have white satin ribbons that can hang loose or be tied into pretty bows.